Artist Uma Thurman (39 years old) can't wait to come back acting in next Kill Bill sequel movie. She so enthusiastic because training session used samurai that she will acted make her feels fresh and healthy. 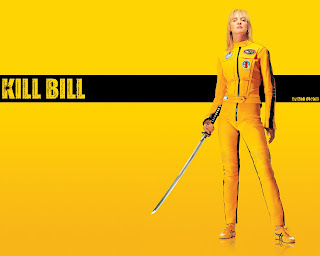 Before that session, Thurman spend time for nine months to practice some fighter techniques from professional teacher, for his role as The Bride, professional killer in Kill Bill Volume 1 and 2 sequel directed by Quentin Tarantino. "When time start to shooting next, they must be trained me very hardly. This is fun because the training is not likes really kung fu. I can't defend my self when someone asked me to fight," says Thurman. "I never push my self to that extreme level before. I feel like succeed to survival in a fight, it's something out of control," add Thurman who also played in Batman and Robin. Before entering acting world, Hollywood actress Scarlett Johansson, known had obsession to sing in her childhood time. Frank Sinatra is her idol. Sinatra’s songs inspired her spirit to jump into entertainment world. With Sinatra’s songs, ScarJo, nick name of Scarlett Johansson, she joined to karaoke following Sinatra song. “I think every child must have dream like that,” she says. Johansson was born on November 22, 1984 in New York, United States. Beside has older brother and sister, she also has her twin brother, he is Hunter Johansson. She started her acting carrier since youth. In 2003 Johansson nominated for two Golden Globes for Girl with a Pearl Earring (2003) and Lost in Translation (2003). She married with actor Ryan Reynold (The Proposal, Smokin’ Aces, The Amityville Horror) without publication last year. “I never planned that wedding, everything ran naturally,” she explains. About her future carrier, Johansson will keep loves Broadway that orbited her name. “Something that worries me, I know nothing about movie world,” says the sexiest woman of FHM and Esquire version. Youth and village people fulfill house roof in dusty small village at Mirzapur, North India region. They curious to see shooting process of Academy Award winner, Julia Robert (42 years old) for her new movie: Eat, Pray, Love. To keep safe woman who has real name Julia Fiona Robert, some police stand by in shooting location area with tight security. Some body guard also make fence around shooting location to protect her from visitor attacked. Mirzapur is small village far 56 kilometer from south New Delhi, suddenly became attention focus of public, television crew, and photographers. Julia Robert look wears cloth of India woman, with turquoise blue robe and long cloth. This time Julia Robert player role real story of writer named Elizabeth Gilbert, an American woman who tried to forget her pain married memory. She make traveled to Italia, India, and Indonesia (Bali). The shooting take in started with pray from Hindu priest. India newspaper, The Times, reported that priest give Gods of Hindu name to three children of Julia Robert. For twin Hazel and Phinnaeus get name Laxmi and Ganesh, meanwhile Henri get name Khrisna Balram. Laxmi is name for God of Lucky and Wealth, Ganesh for God of Wisdom or Knowledge, and Khrisna is the eighth avatar or reincarnation of the god Vishnu. Lily Allen (24 years old) feels uncomfortable when heard issue that she afraid to forgotten by her fans because people more interesting to another female singer. “I never feel in competition with another female singer. This year is own female singer like La Roux and Little Boot and Florence Welch from Florence and the Machine. I like La Roux, she is my friend. It’s not easy make friend with competitor, but I really like her,” says woman who born on London, England. After released her first single in 2006, Smile, and enjoyed critics and also her success, Allen is keep fight with her popularity. She confessed is difficult to close with another strange person, but in another side she doesn’t want to disappoint them. “Exactly I am shy. I often feel shy when people came and asked my signature. Sometimes I wonder why do this people asked my signature? Really, this is never imaginable,” says Alright, Still album owner. “I feel many people hope that I act more suitable, but I just think like a nurse who must have good manner to everybody for along time,” complaints Allen. Rumer Willis Wants Play with Parent. Rumer Willis, daughter of actor Bruce Willis and actress Demi Moore, wants to play in the same movie with her parent. She think already have enough experience to face to face acting with her parent. Before she already played in some Hollywood movie included her new horror movie, Sorority Row, Rumer also starring 90210 television serial. Girl who born at Paducah, Kentucky, United States of America on August 16, 1988, already play in some films with her parent. Rumer Willis played together with Demi Moore in Striptease (1996). She also played with Bruce Willis in The Whole Nine Yards (2000) and Hostage (2005). “I want to play with them together (Bruce Willis and Demi Moore) in more challenge character,” says Rumer who thinks they can help each other when they play in same movie. “When my father must be act with drain of some emotion, he think need to take long time with looking our picture, his family. But when he (Bruce Willis) plays as father who his daughter kidnapped in Hostage, he doesn’t need to look our picture because we presence in there place….,” explains Rumer who wants to play with her parent not as their daughter. Ckaire Danes (30 years old) asked advice to her friends how she can keep faithfully approach her marriage with actor Hugh Dancy. Artist who plays role in Stardust movie curious that the monogamy marriage model still reasonable to followed. Danes also starring in Romeo+Juliet and The Hours will bridge for the first time on September 2009. She will saying marriage vow with Dancy (34 years old), England born actor. Danes and Dancy have planning to come back to France, place where Dancy proposed marriage to this New York born artist in romantic holiday on December last year. “I have intense discusses with my friends about how monogamy possible to follow? Is monogamy still reasonable? I decided, there is no marriage model better than monogamy. Even monogamy demanded discipline and ego sacrificed of each other, but this is must be fun to following,” says Danes quoted from BlackBook magazine. Danes and Dancy make closely relationship since 2009. This spouse met in shooting location for the same film their starring, Evening.